> Capital structure refers to the mix or proportion of different sources of finance (debt and equity) to total capitalization. A firm should select such a financing-mix which maximizes its value the shareholders wealth (or minimizes its overall cost of capital) such a capital structure is referred to as the optimum capital structure. > Capital structure theories explain the theoretical relationship between capital structure, overall cost of capital and valuation. The four important theories are, (i) Net income (NI) approach, (ii) Net operating income (NOI) approach. (iii) Modigliani and Miller (MM) approach and (iv) Traditional approach. > According to the NI approach, capital structure is relevant as it affects the firm. The core of this approach is that as the ratio of less expensive source of funds (i.e., debt) increases in the capital structure, the decreases and V of firm increase. 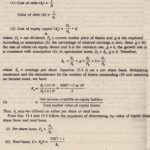 With a judicious mixture of debt and equity a firm, can evolve an optimum capital structure at which the would be the lowest, the V of the firm the highest and the market price per share the maximum. > The NOI approach is diametrically opposite to the NI approach. The essence of this approach is that capital structure decision of a corporate does not affect its cost of capital and valuation, and, hence, irrelevant. The main argument of NOI is that an increase is the proportion of debt in the capital structure would lead to an increase in the financial risk of the equity holders. To compensate for the increased risk, they would require a higher rate of return (k) on their investment. As a result, the advantage of the lower cost of debt would exactly be neutralized by the increase in the cost of equity. The cost of debt has two components: (i) explicit, represented by rate of interest, and (ii) implicit, represented by the increase in the cost of equity capital: Therefore, the real cost of debt and equity would be the same and there is nothing like an optimum capital structure. > Modigliani and Miller (MM) concur with NOI and provide a, behavioral justification for the irrelevance of capital structure. They maintain that the cost of capital and the value of the firm do not change with a change in leverage. > They contend that the total value of homogeneous firms that differ only in respect of leverage cannot be different because of the operations of arbitrage. The arbitrage refers to the switching over operations, that is, the investors switch over from the over-valued firm (levered firm) to the under-valued firms (unlevered). The essence of arbitrage is that the investors (arbitragers) are able to substitute personal or home-made leverage of corporate leverage. The switching operation drives the total value of the two homogeneous firms equal. > The basic premises of the MM approach, in practice, are of doubtful validity. As a result, the arbitrage process is impeded. To the extent, the arbitrage process is imperfect, it implies that the capital structure matters. > The MM contend that with corporate taxes debt has a definite advantage as interest paid on debt is tax-deductible and leverage will lower the overall cost of capital. The value of the levered firm (V) would exceed the value of the unlevered firm (V) by an amount equal to levered firm’s debt multiplied by tax rate. > The traditional approach is mid-way between the two extreme (the NI and NOI) approaches. The crux of this approach is that through a judicious combination of debt and equity, a firm can increase its value (V) and reduce its cost of capital (k) upto a point. However, beyond that point, the use of additional debt will increase the financial risk of the investors as well as of the lenders and as a result will cause a rise in the ku. At such a point, the capital structure is optimum. In other words, at the optimum capital structure the marginal real cost of debt (both implicit and explicit) will be equal to the real cost of equity.